I apologize upfront for being so lax in my Science Fiction Fantasy Saturday posting...what's it been, almost a month now? Well, amidst all of my posts about my free Aston giveaways (Seeker and my first Triple-Shot), it almost seems like I'm a one-trick pony, stuck on all things Aston West. Now you may not think this is a problem (and bless you if you fall in this category...), but for those who like a little variety, I also have a standalone novel, The Cure, which I'm going to be providing a snippet from today. 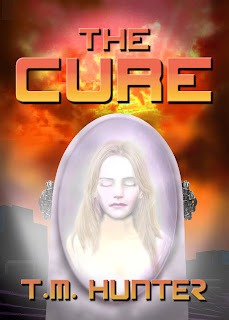 The premise of The Cure is simple...A scientist (Mila Groso) watched her family get murdered, and has decided to bring them back to life at any cost. Unfortunately, she has no idea how much it may cost her in the end. So, to set up this scene, Mila has just been informed that her team has something special to show her from their testing (of dead rodents). “Wait for it,” Billy’s lighthearted tone cautioned. She grimaced at this waste of her time, but held her tongue and did as he said. Without warning, the mouse stood on its haunches, eyes wide, whiskers twitching. Mila let out a joyful squeal. Sadly, ten sentences barely seems enough, but it will have to suffice for this week. Enjoy the snippet? Pick up a copy of the full book...and be sure to go check out the rest of the Science Fiction Fantasy Saturday snippets. And of course, I'd be remiss in not letting my legions of Aston fans know that although this is a standalone novel, it does come into play with a future Aston novel. So stay tuned! Exciting! And since I've read this already, all I'll say is everyone should read it!! Great book!! Zombie mouse - I can see the t-shirt already. Great premise and an engaging main character. Looking forward to seeing more. ugh. I'm battling mice in my house, so zombie mice shambling around on two legs scare the crap out of me! But what a great idea for a book. :) There's always a consequence to bringing the really dead back to life. I'm with TK on this - a great story. And this little snippet is so vivid. I like the bit about her potential to be impressed. So has a human been brought to life as a mouse? I'm here, BTW--preloaded three at once and forgot the linkback on one. Awesome! I have a soft spot for any zombie-related fiction. I must give this a read. Great snip! I always love the idea of changing nature. There are always so many dire consequences. And this has all the lovely elements of that exact story. Missed your snippets! I keep hoping that I'll get back in the swing of doing them weekly, but it never seems to turn out that way.